In the tradition of EuroComb’01 (Barcelona), Eurocomb’03 (Prague), EuroComb’05 (Berlin), Eurocomb’07 (Seville), Eurocomb’09 (Bordeaux), Eurocomb’11 (Budapest), and Eurocomb’13 (Pisa) this conference will cover the full range of Combinatorics and Graph Theory including applications in other areas of Mathematics, Computer Science and Engineering. There will be a special volume of the Electronic Notes in Discrete Mathematics with the accepted extended abstracts. 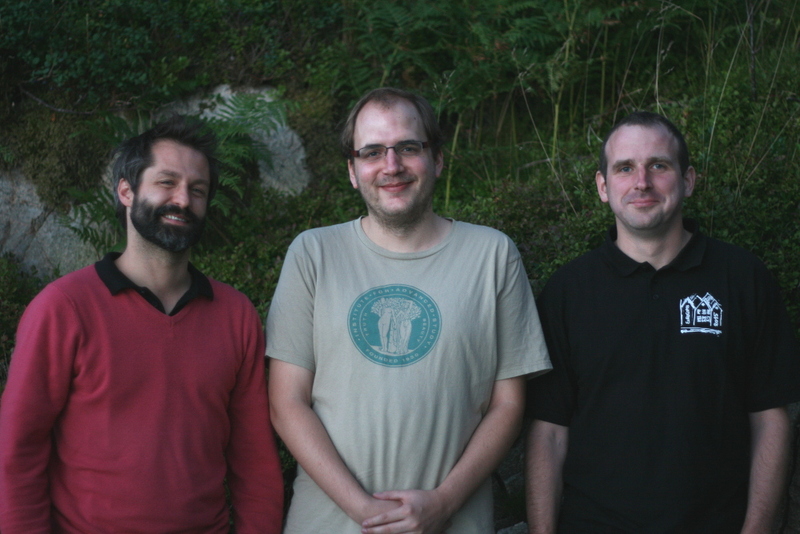 European Prize in Combinatorics awarded at Eurocomb 2015, Bergen, jury report. Continuing with the tradition established at EuroComb’03 in Prague the European Prize in Combinatorics will be awarded during the conference EuroComb 2015. The prize is established to recognize excellent contributions in Combinatorics, Discrete Mathematics and their Applications by young European researchers (eligibility of EU) not older than 35. The prize carries a monetary award of 2500 Euro. The nomination letter including CV and the list of publications of the nominee must be sent to the organizers of EUROCOMB’15 before April 15, 2013. The nominations will be evaluated by an international jury. The award of 2500 EURO for 2015 is founded with contributions of DIMATIA, local organizers and Elsevier B.V. This year the prize was given out to Karim Adiprasito, Zdenek Dvorak, and Rob Morris. Congratulations to them all. Prize winners Rob Morris, Karim Adiprasito, and Zdenek Dvorak. The first Prize was presented at the European Combinatorial Conference EuroComb’03 held in Prague. Two prizes were awarded: one jointly to Daniela Kühn and Deryk Osthus, and a second to Alain Plagne. The second Prize was awarded at the European Combinatorial Conference EuroComb’05 held in Berlin to Dmitry Feichtner-Kozlov. The third one was awarded at EuroComb’07 in Sevilla to Gilles Schaeffer. At EuroComb’09 in Bordeaux two prizes were awarded: one to Peter Keevash and a second to Balázs Szegedy. 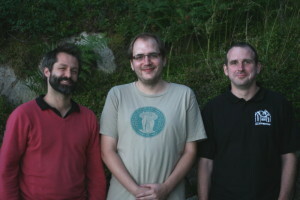 In 2011 two prizes were given to David Conlon and Daniel Kral. In 2013 two prizes were given to Tom Sanders and Wojciech Samotij. 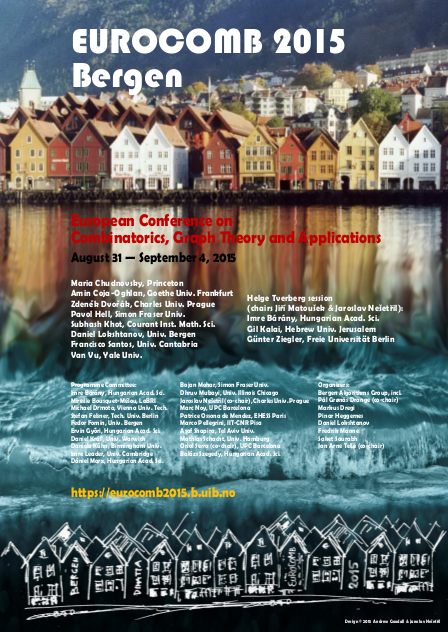 A special issue of European Journal on Combinatorics will be devoted to selected papers contributed to the conference. The usual high standards of the journal will be applied through a strict and thorough refereeing process. The conference is organized by the Department of Informatics at the University of Bergen at the Hotel Terminus in Bergen, Norway. The organizing committee can be contacted at Jan.Arne.Telle@ii.uib.no. Download our Eurocomb 2015 poster (pdf).